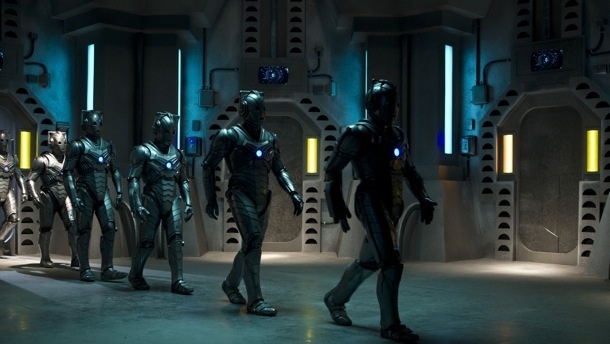 It's been three days since "Nightmare in Silver" - this season's much-anticipated episode of Doctor Who penned by Neil Gaiman - aired and the thing I still can't get out of my head is how fast that Cyberman was. Think back to the first time you watched "Remembrance of the Daleks", the big story that marked Doctor Who's 25th anniversary in 1988. And that numb-struck look of terror on The Doctor's face as that Dalek did something no Dalek had ever done before: it climbed the stairs during its hellbent pursuit. Well, that high-speed Cyberman scared me worse than that! I was literally screaming "HOLY SH-T!!" (and other stuff) at the top of my lungs and I barely realized it. After decades of watching the Cybermen clank around in that clumsy armor, for one to run and attack almost faster than the eye could follow was an automatic "behind the sofa" moment. And it was neat to see the return of the Cybermen's biggest weakness being gold. How The Doctor was able to use it was definitely a slick and brilliant move. 'Twoul be great to see that vulnerability exploited again: I've no doubt that Matt Smith's Doctor could have all kinds of fun with it! I found Hedgewick's World of Wonders to be a well-imagined and quite offbeat place to have set a story like this. I mean: the universe's greatest amusement park? Somehow that worked to "up" the creepiness of the episode's atmosphere. I think Gaiman set out to do two things with "Nightmare in Silver": to re-establish the Cybermen as the horrifying threat they were always meant to be, and to apply his inimitable style toward a "Doctor. vs. Doctor" conflict. And to a great degree, I believe he pulled off each of those tricks. Although I have felt at times that "Nightmare in Silver" could have focused more time on the Cybermen themselves, but knowing that it's a Neil Gaiman story made me enjoy with greater appreciation The Doctor's internalized conflict with his Cyber-Plannerized "Mr. Clever" ego. The Doctor at war with "Mr. Clever" was a well-executed duel that never descended into cheap gimmickery which that sort of thing has become in too many other stories throughout fiction. Matt Smith has been at the top of his form as The Doctor this season and with "Nightmare in Silver" he brings that power and to bear against no less an opponent than himself... and it is a treat to behold! Clara (Jenna-Louise Coleman) continues to be a pleasure to watch. She's definitely getting her hands dirtier so far as the action goes. And the dialogue between her and the Cyber-Planner was positively dark and chilling. More foreshadowing, no doubt, of what is to come. Along with all the other in-show references (fewer in this episode than the previous ones, but they were otherwise well-employed). But I can't write about "Nightmare in Silver" without remarking upon the best use of a guest star this season: Warwick Davis as Porridge. This month marks thirty years since Davis first appeared on the big screen as Wicket the Ewok in Star Wars Episode VI: Return of the Jedi and since then he's become quite an accomplished actor (most notably as Professor Flitwick throughout the Harry Potter movie series). I thought his portrayal of Porridge was sweet, comical and tragic... all at once. Davis was a delight to watch and I for one would love to see Porridge return again. I'm going to give "Nightmare in Silver" Four out of Five possible Sonic Screwdrivers. It could have been even better with a bit of trimming off the fat (yeah Artie and Angie again) but I'm choosing instead to focus on the The Doctor's battle with his own intellect, and the re-scaryfying of the Cybermen. Speaking of which, I'll never look at a cockroach again without having those nasty Cybermites coming to mind. And this Saturday night: the season finale of Doctor Who. His path will take him to the Fields of Trenzalor. The one place he must never go to. And there... the question. "The oldest question in the universe." "The question hidden in plain sight." "The question that must never be answered." "The question he has been running from for all his life..."